Live concert footage from the Paramount in Seattle in 2002. If you look at the long list of musical artists inducted into the Rock and Roll Hall of Fame over the last 30 years, you’ll find many females. However, you’ll not locate many female rockers, and you’ll discover even fewer female-fronted rock bands. The show’s 19 songs span the band’s career, though with an emphasis on their 1970s heyday. 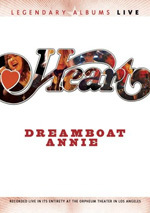 From 1975’s Dreamboat Annie, we find the title song, “Crazy On You” and “Magic Man”, while 1977’s Little Queen brings us “Barracuda” and “Love Alive”. 1978’s Dog & Butterfly presents the title song, “Straight On” and “Mistral Wind”. 1985’s “comeback album” Heart boasts “These Dreams”, and “Alone” stems from 1987’s follow-up Bad Animals. 1990’s Brigade provides “Wild Child”. Alive features four songs that were new circa 2002: “Sister Wild Rose”, “Heaven”, “Two Faces of Eve” and “Break the Rock”. We also find covers of Elton John’s “Mona Lisas And Mad Hatters”, the Sonics’ “The Witch”, and Led Zeppelin’s “Battle of Evermore” and “Black Dog”. That seems like a good array of songs, and Alive presents the material in a satisfying enough manner. Let’s face it: Heart were always a competent “meat and potatoes” rock band, one that gave us a decent catalog of satisfying rockers but not one who could rise above their origins. They nodded toward influences like Led Zeppelin early and often, and those traits never really changed. Which is fine, as one can’t expect every band to blaze trails. At their peak, they gave us energetic rock, and that’s where they stayed for their 40-year career. Even without a lot of creative inspiration, Heart offered a pretty solid collection of songs, and Alive represents them well enough. I’ve heard Ann Wilson’s voice has started to falter in recent years, but as of 2002, she retained plenty of power and range, so her vocals add to the experience. Other than Ann and her vocalist/guitarist sister Nancy, you’ll find no one from Heart’s 1970s heyday – heck, the band circa 2002 didn’t even include anyone from their 1980s revival. These guys may be hired guns, but they perform the music well enough – I can’t claim they bring any magic to the material, but they give it adequate punch. Director Dave Diomedi reproduces the concert with reasonable restraint. In a pleasing choice, Diomedi largely avoids crowd shots – the bane of concert films – and he also keeps editing subdued. We get a good view of the band without gimmicks or distractions, factors that make this a satisfying representation of the concert. And it’s a perfectly decent show. 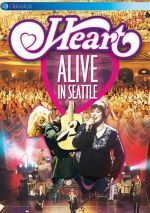 Heart: Alive in Seattle never manages to threaten greatness, but it delivers a pretty good take on a pretty good band. Heart: Alive in Seatt;e appears in an aspect ratio of approximately 1.78:1 on this single-sided, double-layered DVD; the image has been enhanced for 16X9 televisions. This became an acceptable but unexceptional presentation. Sharpness showed the limitations of SD-DVD. That meant close-ups provided pretty good delineation, but anything wider tended to seem somewhat soft and loose. I saw no issues with shimmering, but those wide elements could seem a bit rough around the edges – to a mild degree, at least. No issues with edge haloes or source flaws materialized. Colors manifested mainly through lighting, as the musicians tended toward dark clothing. The hues appeared decent but they could veer toward a little heaviness/runniness. Blacks seemed mostly fine, though they could become somewhat inky on occasion. Shadows also tended to seem somewhat thick. Given the restraints of SD-DVD, this felt like a “B—“ image. As we shift to audio, we find that Alive offers two multichannel options: Dolby Digital 5.0 and DTS 5.0. To my surprise, they sounded moderately different, and I favored the Dolby track. I initially opted for the DTS mix and found it to sound somewhat sterile. The DTS track left the impression that elements – especially lead vocals – had been re-recorded, as it tended to appear “canned”. When I switched to the Dolby track, the audio popped to life in a more vibrant manner. The material sounded more “live” and didn’t leave the DTS mix’s impression that it came from a studio. This simply felt like a real concert performance, while the DTS version appeared less organic. Other than this general vibe, the two tracks seemed fairly similar. Both used the soundscape in the same manner, which meant good stereo music in the front speakers and audience support in the surrounds. Audio quality was mostly comparable, though I thought the Dolby track seemed a little livelier. Vocals were fairly natural and instruments showed good delineation. Even without the use of the LFE channel, bass worked fine. I thought the audio of Alive worked fine, with a vote for the Dolby track as the more natural of the two. In terms of extras, we get an Interview with Ann and Nancy Wilson. Shot in 2002, this eight-minute, 35-second piece covers the concert’s setlist, with some specific notes about the then-new songs. Not much real information emerges from this puffy chat. 2003’s Alive in Seattle brings us Heart more than 25 years into their recording careers, and it shows they still put on good concerts. Nothing about the show excels but it offers a nice overview of the band’s music and seems like a satisfying performance. The DVD provides generally positive picture and audio but it lacks notable supplements. While Alive in Seattle doesn’t dazzle me, it gives us a largely enjoyable concert.